Our Friday-Scheduled Guided Tour is available both in the morning and the afternoon on Fridays. The tour destinations - one in the morning, another in the afternoon - are the two most famous sightseeing spots in Kamakura. You can join the tour by "turning up" to the meeting point. You just come to the specified meeting point at the specified time, and put your signature on the registration sheet. Available to international tourists and foreigners residing in Japan. Accompanying Japanese can attend the tour. However, we do not accept independent Japanese participants. No guide fee is required. However, you must pay for your transport expenses and admission to shrines and temples. You must also pay for the same expenses for your tour guide(s). We walk to Tsurugaoka Hachimangu and its admission is free. The transport expense to the Great Buddha is 200 JPY and its admission fee is 200 JPY. You can walk back to the JR Kamakura Station from the Great Buddha. The Morning Tour starts at 10:30 a.m. and it takes about 50 min. The Afternoon Tour starts at 1:00 p.m. and it takes about 50 min. Just in front of the East Exit of JR Kamakura Station as shown below. Look for the following KWGA flag as a landmark. 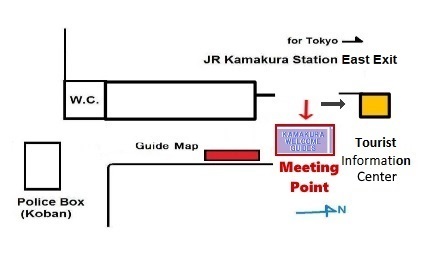 Neither the Kamakura Welcome Guide Association nor the guides are responsible for any injuries, illness, theft and/or damage to possessions or you being lost that may occur during the tour. 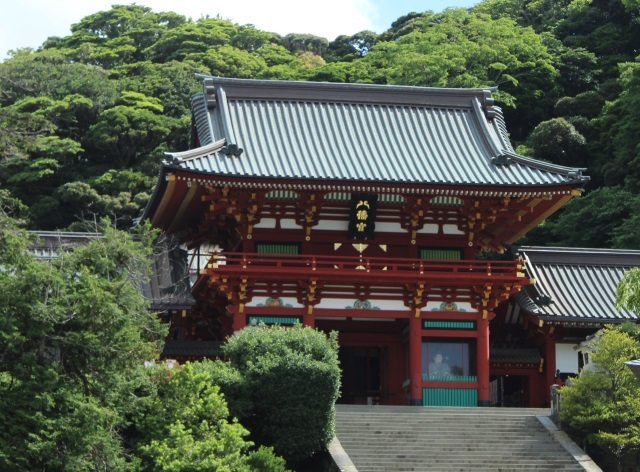 We guide you around Tsurugaoka Hachimangu, the historical native shrine built by the shogun Minamoto Yoritomo. 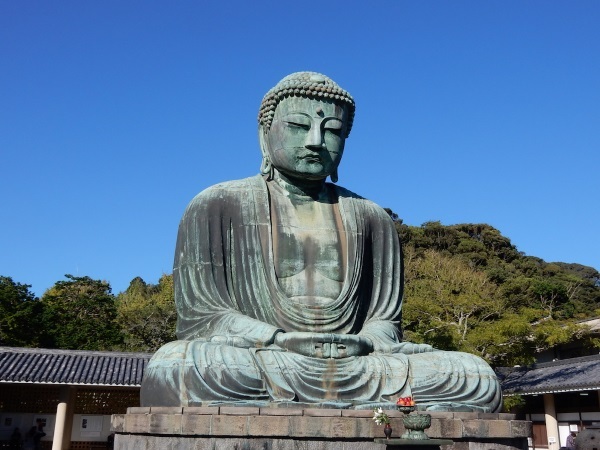 We guide you around the Great Buddha, the historical Buddhist statue in Kamakura.